Submitted by Denise Azucena on Mar. 5, 2018. Originally published on Dec 9, 2016 and most recently updated on Mar 6, 2018 by Denise Azucena & Jason Horton. This guide simplifies the process of buying a beginner drum set and tells you what you need to know to avoid some of the pitfalls in buying drum kits online. We have completed a detailed review of the entry level market for drums and have updated our ratings and recommendations for 2018, based on current ratings and reviews. NB: This guide is specifically about acoustic drums, we have a separate guide for beginner electronic drum sets. What does the word 'Hardware' mean in acoustic drums? What does the number of pieces mean? Why didn't we include 4-piece or 3-piece kits? 86 out of 100. Incorporating 50+ ratings and reviews. The D120B is a 5-piece set with a similar configuration to ddrum's d2 set, only with a much smaller and compact bass drum and toms. Compact and travel friendly were some of the qualities mentioned by a lot of reviewers since the overall construction is also quite sturdy. In addition, many of them found the kit easy to tune. A lot of them also mentioned the sound quality and response were reasonable for its price. Since the cymbals are ideal for beginners, some reviewers found the stock cymbals to be too thin and eventually had to replace and upgrade them. A few of them also found the instruction manual to not be as intuitive as they would have liked, though setting up the kit is quite straightforward. This is an affordable option for those who are starting out. 86 out of 100. Incorporating 60+ ratings and reviews. 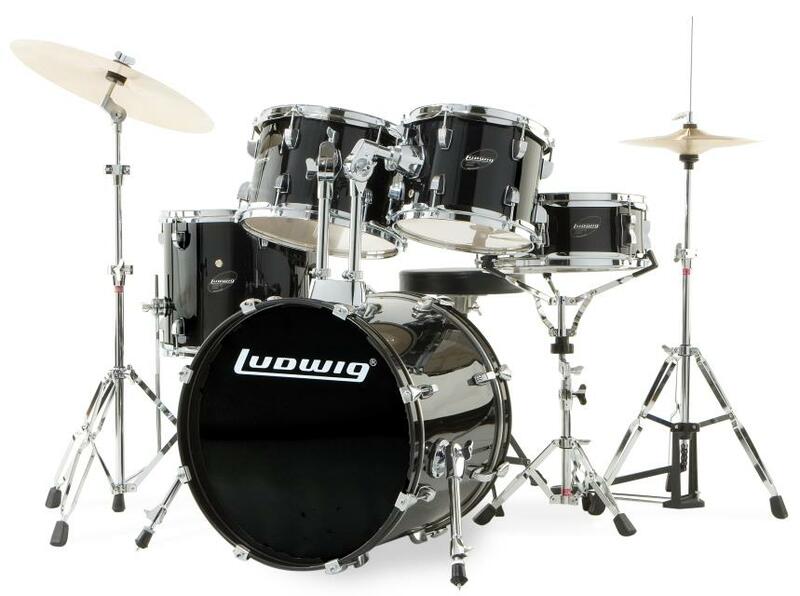 At the time of publication the Ludwig LC175 Accent Drive, along with the Ddrum D120B above, was the equal highest rated drum set under $400. Several people said in their reviews that this sounds like a more expensive kit. One person said that it didn't come with instructions but found it easy enough to set up without them. There was one person who said it sounded so good after replacing the the drum heads that they used it for recording. The quality of the drums were generally well regarded even by people who didn't like the cymbals or throne. A common sentiment in customer reviews was that the cymbals aren't great but good enough for learning on, although there were a few who said the cymbals aren't worth using. One reviewer who had bought both this kit and the Pearl Roadshow RS525SC recommended spending the extra $50 to buy the Pearl kit instead. If your budget only stretches to $400 then this is the kit to get - remember that you'll also need to buy drum sticks separately. 87 out of 100. Incorporating 60+ ratings and reviews. 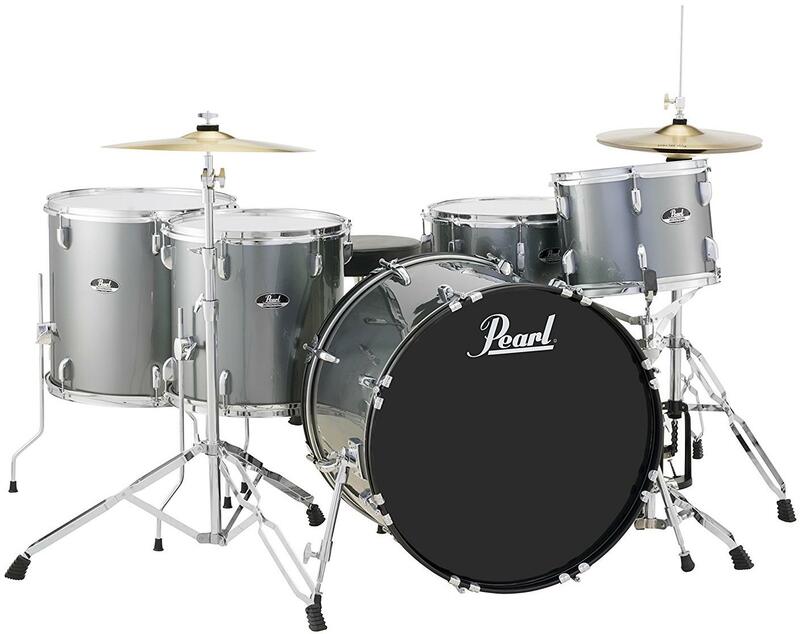 At the time of publication the Pearl Roadshow RS525SC was the highest rated drum set under $500. 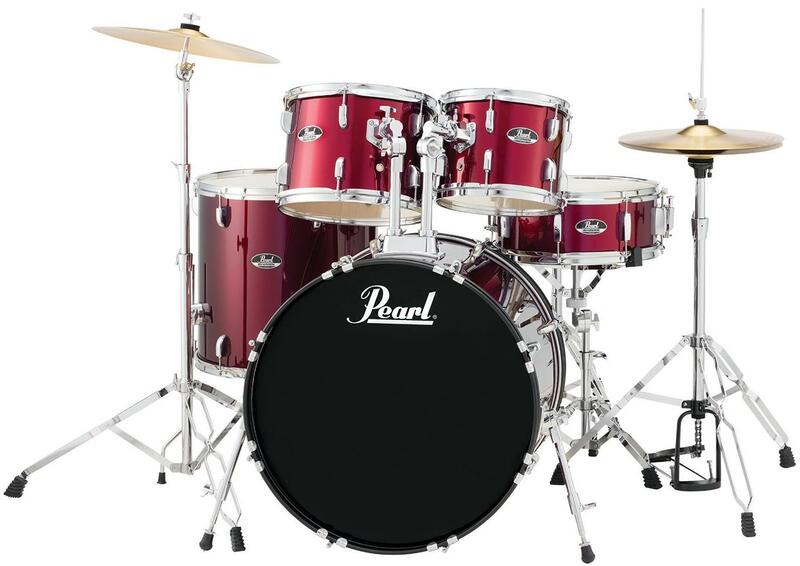 This is different from the other Pearl Roadshow kit featured below which has a shallower snare and a higher pitched tom - this kit is the more traditional of the two. The quality and sound of the drums were repeatedly praised in customer reviews with many reviewers being drummers themselves rather than parents who bought the kit for a child. The quality of the kick pedal, which is sometimes lacking on budget kits, was cited positively by several reviewers. The cymbals were often cited as very basic or low quality - a common complaint with drum sets in this price range. Many people said they replaced the hi-hats with better quality ones after a few months or longer. One person even said the hi-hats were flattening out after only a few months of regular play. If you're unsure which kit to get then put this at the top of your list because it comes from one of the biggest brands in drums and it's the highest rated drum set currently selling with a street price under $500. 87 out of 100. Incorporating 70+ ratings and reviews. Most 5-piece kits have 2 mounted toms and 1 floor tom - the point of difference with the RS525WFC is that it comes with 1 mounted tom and 2 floor toms - the smaller of the two floor toms has a greater diameter than most mounted 2nd toms so it allows for lower tones. The positive customer reviews say this is a good drum set for the money. The quality of sound from the drums was consistently praised in positive reviews. The cymbals got a bit of criticism in both positive and negative reviews with many saying that you'll probably want to change them as you get more experienced. If you're looking for something slightly different in terms of tom sizes, and want to stick with a major drum brand, then this is for you. 89 out of 100. Incorporating 40+ ratings and reviews. 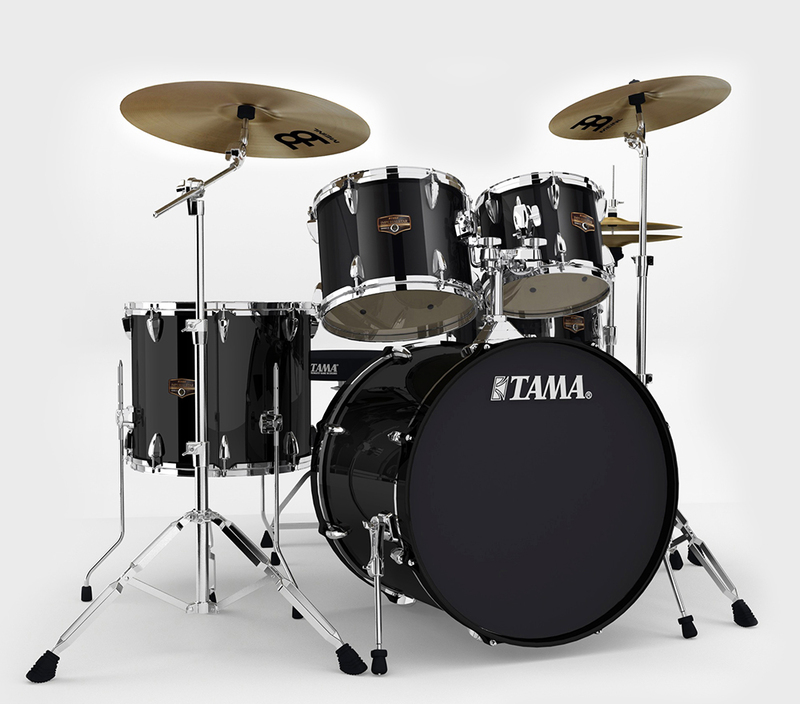 The Tama Imperialstar drum set features poplar shells that provide a quick decay and full-bodied tone, and drum rings that provides a wide tuning range and sensitive playing dynamics. Many users who have owned this drum set for a long time were impressed by its good quality hardware and shells that were quite sturdy and durable. The snare sounded tight and crisp, while the rest of the drums provided great response. The cymbals also were reviewed as quite decent and provided a bright sound. In their MusicRadarM review, it was mentioned that the toms had "a warm tone, only a touch less focused than high-end maple or birch. The bass drum heads have perimeter muffling rings, as is the trend today. The result is a big, booming sound with all the depth and power you would want. " A few users found some issues with the high pitch snare and attachment. In any case, they usually replaced the needed parts without any problems. 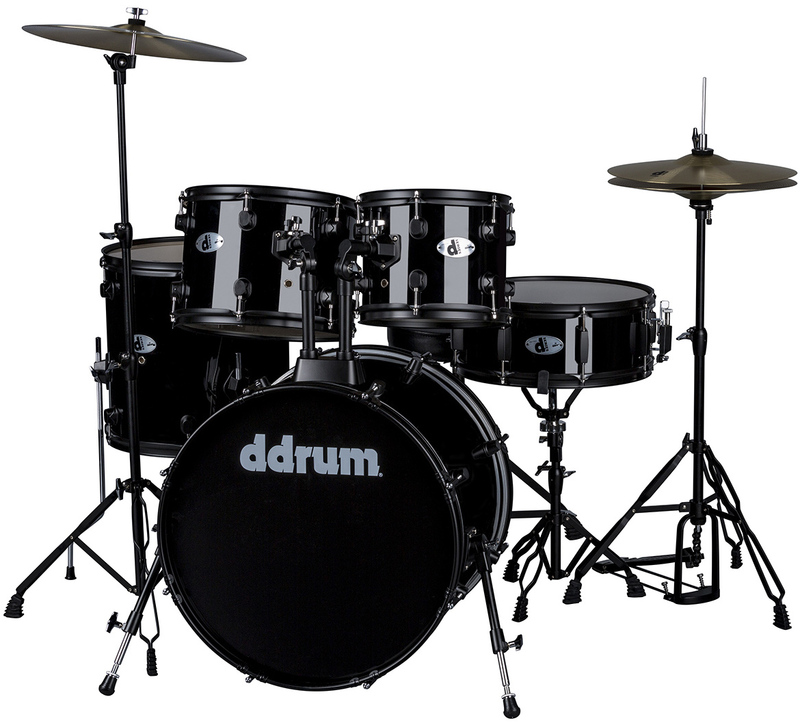 This is an excellent entry level drum set that's suitable for regular gigging. One of the things that catches some people out is that they get a bargain price only to find they hadn't bought a complete kit with all the hardware - often the really low prices for a particular model are because it's only a shell set - that means it only contains the drum shells and nothing else. You may have seen listings or advertisements that say "all hardware included". What they are referring to is the hardware necessary to hold cymbals, hi-hats, snares, rack-mounted toms and any other percussion items in the kit. Many kits are sold without things like cymbal and snare stands because they're intended for drummers who already have that hardware and it's just the drums by themselves that they want to buy. Sometimes you'll see the phrase 'double braced hardware', this means there are two pieces of metal adding extra strength to the bracing. Traditionally with acoustic drum kits we count the number of drums as the pieces - cymbals and other items are not included in the count. So when a drum set has a snare, kick drum and 3 toms, this adds up to 5 pieces. This tradition isn't always followed by makers of electronic drum sets who often count any triggering device as a piece including electronic cymbals. The standard configuration of a basic drum kit is to have 1 snare, 2 mounted toms, 1 floor tom, and 1 kick drum. This is the best configuration to start out with when you're learning because it's the setup many other kits will have that you'll have to play at times. This is important because drummers often have to share kits at places like drum lessons and in some live performance situations because drums take longer than other instruments to set up and to mic up when that's needed. EG: Many 'battle of the bands' type competitions require bands to share back-line equipment and drum kits. Yes, but no. You may have heard things like 'mahogany is better than poplar wood' on the shells of your drums - but the distinctions in tone are subtle and when you're just starting out you probably won't notice much of a difference. Don't go spending extra money on a beginner drum set just to get 'better sounding' wood - just get the best kit you can afford for now and a couple of years down the road you'll develop the ears you need to tell what kinds of wood suit your style of music best. Often these are included when you buy a drum set but not always. They're not very expensive so I recommend buying a couple of sets of different weights: Vic Firth 5A at Amazon - Vic Firth 5B at Amazon. If you would like to learn more about your stick options then read our guide: The Best Drum Sticks + Brushes & Mallets. One of the ways manufacturers are able to produce drum sets at these low prices is by providing only very basic cymbals. The vast majority of people who have bought a beginner set and continued playing drums on an ongoing basis tended to get new cymbals including hi-hats, crash and ride - this is probably the most common point made in verified customer reviews. You won't find any brand name cymbals such as Zildjian or Sabian included with cheap kits. In this guide we state the diameter first, then the depth. So a 14" x 5.5" snare is 14" in diameter and 5.5" deep. I point this out because sometimes manufacturers and retailers state the measurements the other way around. Ply - a ply is a single layer of wood. Drum shells are typically made from multiple layers of wood so a 9 Ply shell means it has 9 layers. Drum Kit vs Drum Set - these terms are essentially interchangeable and mean the same thing at music retailers. Drum Throne vs Drum Stool - drummers sit on thrones, pianists sit on stools - other than that they mean the same thing. Kick Drum vs Bass Drum - in terms of drum sets these terms are also interchangeable and mean the same thing. Technically a kick drum is designed to be used with a kick pedal but there are bass drums not designed for that purpose such as ones you might see played in an orchestra or marching band. Cymbals - Crash, Splash, Ride, Hi-Hats... Hi-hats and Ride cymbals are often played continuously through parts of a song while crash cymbals are used for accent and in fills. Splash cymbals are just smaller, higher pitched versions of crash cymbals. For a basic standard set up you'll want to have hi-hats and at least 1 crash cymbal. Most budget drum sets only come with a single crash or a single combined crash/ride cymbal. Drummer's Key - These are used to loosen and tighten the lugs on your drum heads in order to tune them to the pitch you want. Drum tuning advice is beyond the scope of this guide but here are some helpful references: What You Need to Know About Drum Tuning by Ben Meyer at Modern Drummer, and Drum Tuning by Gene Okamoto of Pearl Corporation. The drum skins often come loose or detached on a new kit so you'll also need the key to properly install/tune them when your kit is delivered. We went through the entire lists of sub $750 drum sets at most of the major online retailers in the USA and selected only the full-sized kits that were complete with all the hardware needed to set up and start playing the moment your new drum kit is delivered - note that this doesn't always include a drum throne. For this update, our short list expands to 18 options, featuring the most promising 5-piece or larger drum sets based on their current ratings. Relevant reviews and ratings data were then processed using the Gearank Algorithm to produce the independent Gearank scores which we used to come up with our recommended list. To summarize; the criteria for inclusion were that it had to have all necessary hardware, had to be full-sized which in this case means at least a 20" Kick/Bass drum, and it had to have a minimum of 5-pieces. For more information about our methodology see How Gearank Works. Submitted by Jason Horton on Mar. 7, 2018.